Input Amplifier Module: a low noise circuit equipped with a variable voltage-gain (10 - 100) preset, primarily intended as high quality microphone input, also suitable for low-level line input. Main Mixer Amplifier Module: a stereo circuit incorporating two virtual-earth mixers and showing the connection of one Main Fader and one Pan-Pot. Obviously this layout can be rearranged at everyone wish. An astonishing feature of this design lies in the fact that a complete stereo mixer as shown below in the Block diagram draws less than 6mA current! The basic arrangement of this circuit is derived from the old Quad magnetic pick-up cartridge module. The circuit was rearranged to cope with microphone input and a single-rail low voltage supply. 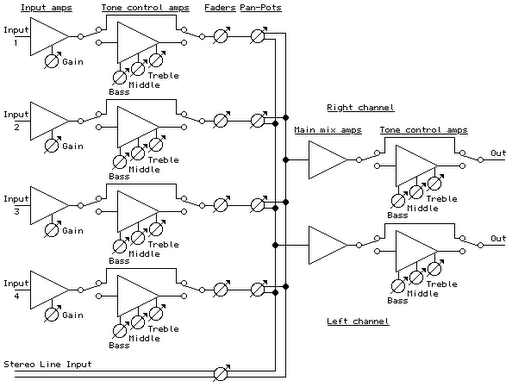 This low-noise, fully symmetrical, two-transistor head amplifier layout, allows the use of a normal FET input Op-Amp as the second gain stage, even for very sensitive microphone inputs. The voltage-gain of this amplifier can be varied by means of R9 from 10 to 100, i.e. 20 to 40dB. Current drawing for one Input Amplifier Module is 600µA. Current drawing for one Tone Control Module is 400µA. THD is below 0.01% @ 1V RMS output. The schematic of this circuit is drawn as a stereo unit to better show the input Main Fader and Pan-Pot connections. The TL062 chip contains two TL061 op-amps into the same 8 pin case and is wired as two virtual-earth mixer amplifiers having a voltage gain of about 4, to compensate for losses introduced in the passive Pan-Pot circuitry. Therefore, total voltage-gain is 1. Current drawing for one stereo Main Mixer Amplifier Module is 800µA.